Max likes to watch a whole lot of fire truck videos on YouTube. He's fond of ones taken in New York City and Orlando, where he plans to move. I have never fully decided whether this habit is good, bad or neutral. I mean, any screen times takes you away from doing activities that don't involve sitting on a couch, so there's that. But fire truck videos seem more innocuous than dippy tween sitcoms or video games. Turns out they have a bit of educational value. Max has a Weekend Report due every Monday at school, with fill-in-the blanks for what he ate, went to see, watched and listened to. (He uses the SnapType Pro app on his iPad). It was a given what "watched" would be for last Friday: My boy went to see an early evening showing of Incredibles 2 all by himself. Yep. It was the sixth time he was seeing the movie, and he asked to go alone. (Not that any of us were dying to see it again.) He was pretty proud of that. 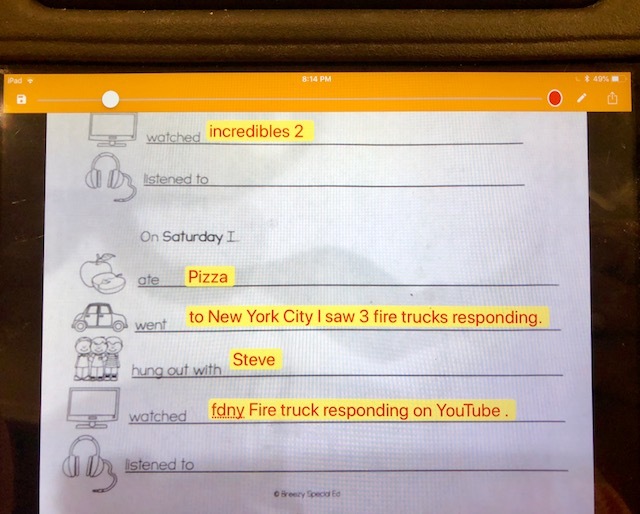 I was especially gleeful to see what he typed about where he went on Saturday ("I went to New York City I saw 3 fire trucks responding") and what he watched ("FDNY fire truck responding on YouTube). I had no idea he knew that word. Then I realized it was straight off the YouTube fire truck videos, some of which have "fire trucks responding" in their titles. Max had picked up the word from there, and was using it appropriately. Max's vocabulary is coming along, slowly but surely. Every single new word is exciting. So I felt a smidge better about his obsession with fire truck videos. And yes, we've tried to get him to watch other stuff. For now, it's fire trucks. Responding!